Thirty three years of service to Pillsbury of Canada Ltd. and the flour mills that preceded it on the same site, came to an end Friday for 70-year-old R. J. Williamson. The occasion was marked by the presentation of gifts from the company and fellow employees. 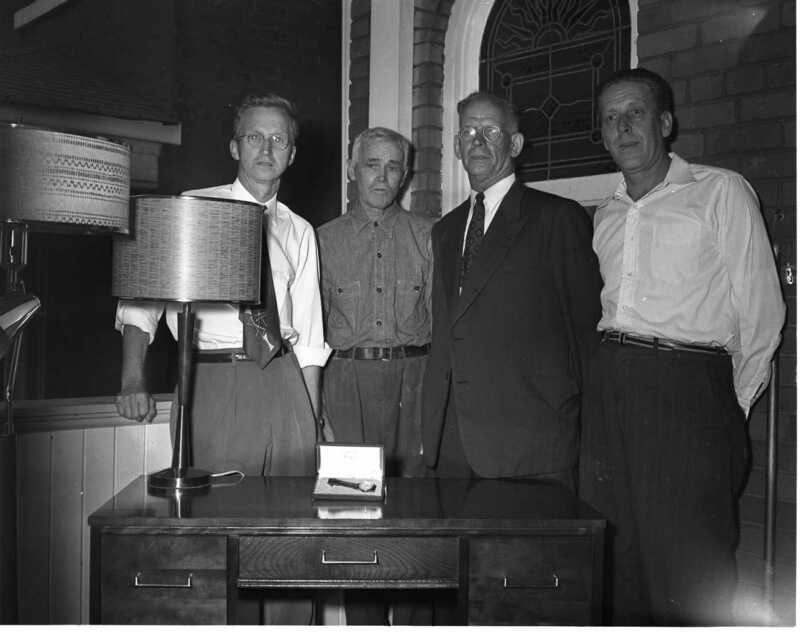 Vic Wadge, Mr. Williamson, Jack Lang and Jack Cleaver, all veteran employees of the Midland mill. Mr. Williamson started his career in May of 1924 with the Copeland Milling Company. He resides at 297 First Street. Many thousands of yards of fill have gone into the new arm of the Trans-Canada Highway where it circles Waubaushene on the east. 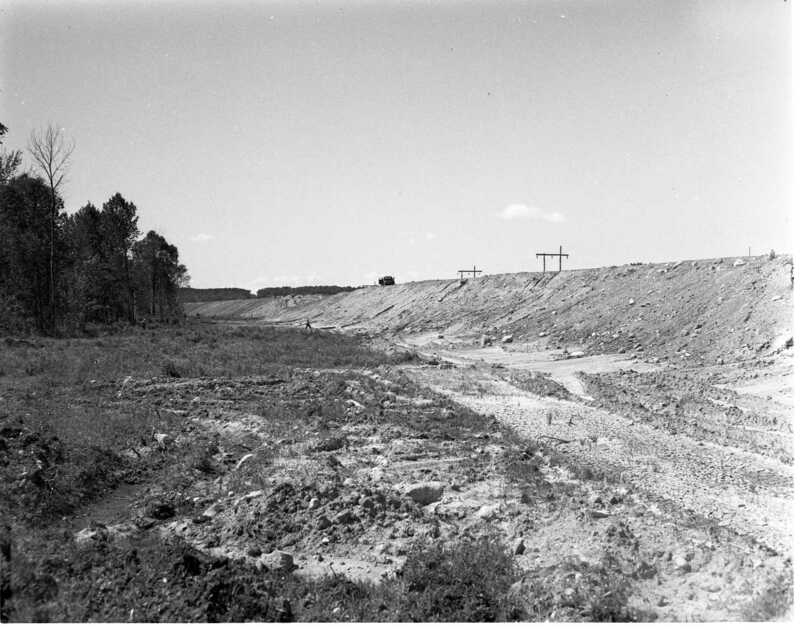 The road has been built up here to provide for an overhead bridge over the CNR tracks which cross at the end of the bush on the left. Another new bridge will go in to cross the gap at the neck of Matchedash Bay. There were a lot of disappointed people all over Ontario as well as Midland when the draw was made by Midland Rotary Club for this outboard boat, motor and trailer recently. One real “happy fellow”, however, was Dr. Dalton Martin of Midland, right. He was the lucky winner. Jack Duggan is seen turning the prize over to Dr. Martin at the town dock Wednesday afternoon. 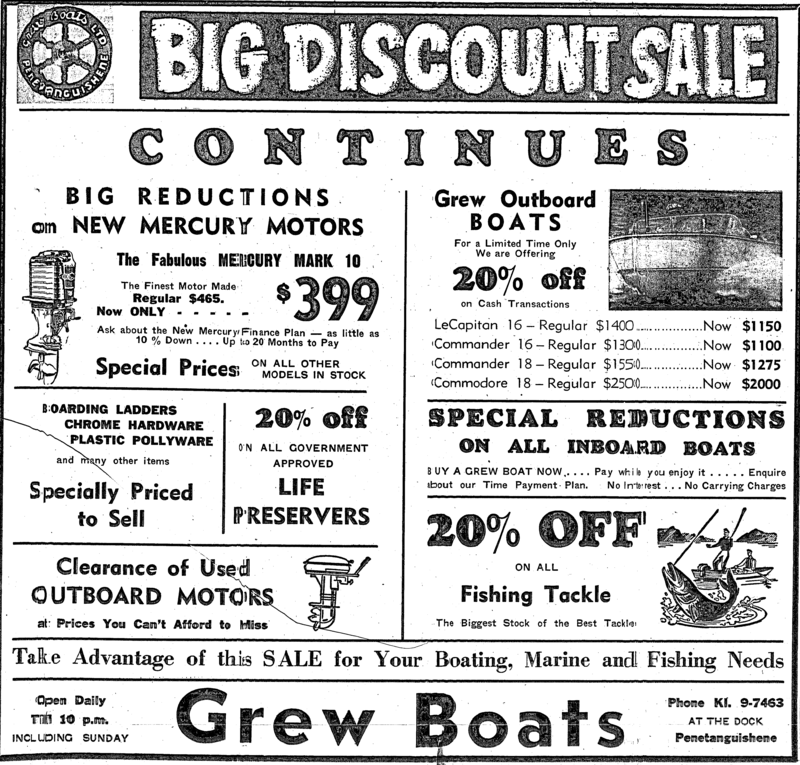 Jack was in charge of the boat selling campaign for the Rotarians. Native bowling alley is one of the new attractions at the Huron Indian Village in Midland this year. Stewart Guthrie demonstrates how round stones were rolled to knock other stones off of a flat rock. 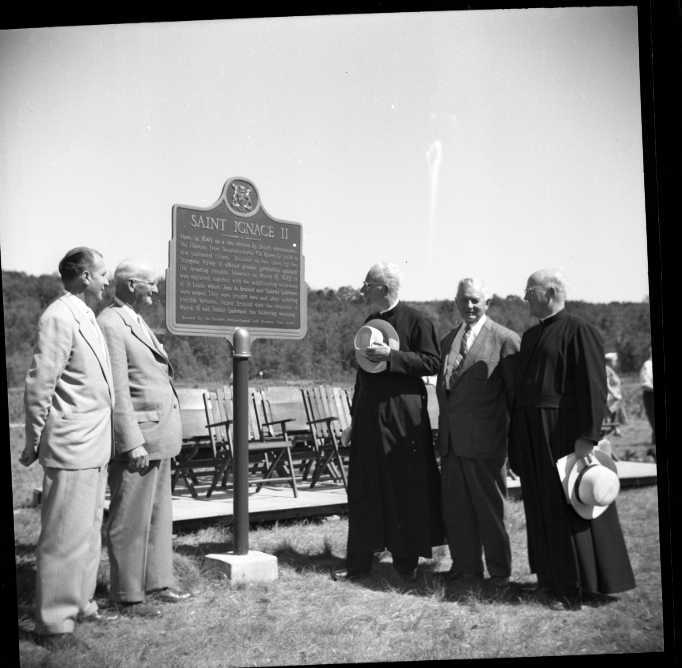 The unveiling of the Ontario historical plaque marking the site of Saint Ignace ll and the martyrdom of the Jesuit missionaries Fathers Lalement and Brebeuf. 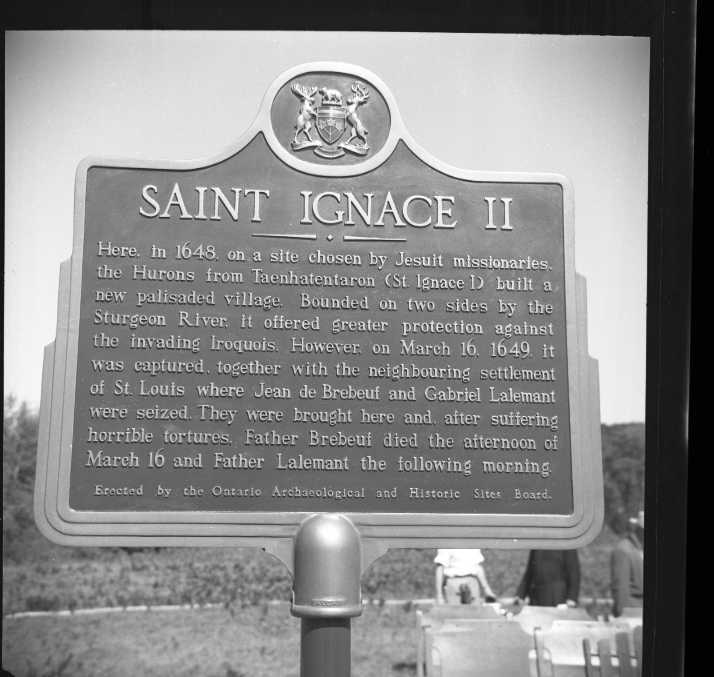 The site is on the east side of Concession 8, now Rosemount Road, south of Highway 12 and south of the Sturgeon River. In the photo is Bernard Leclair, George M. Johnston, MLA; first director of the Martyr’s Shrine, Rev. J. M. Fillion, Dr. W. W. Jury and Rev. John McCaffrey, present director of the Shrine. 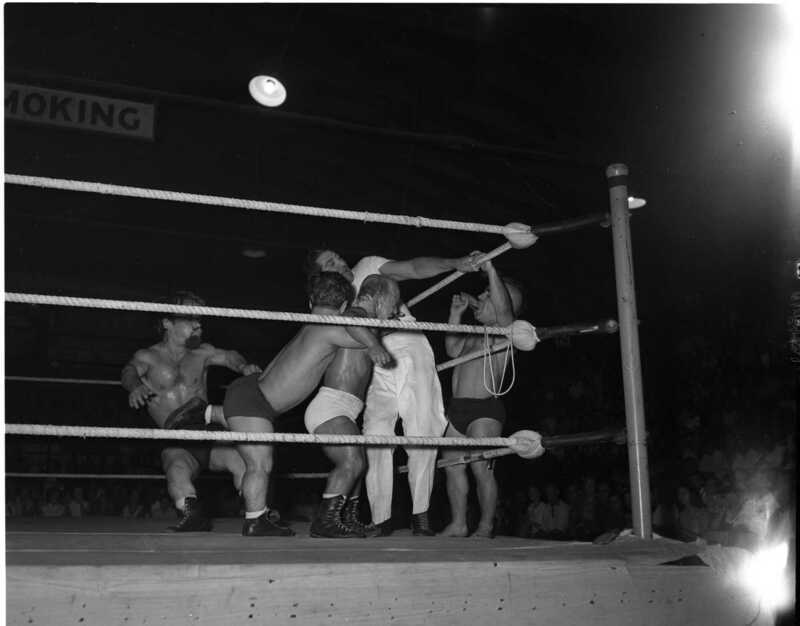 More fun than a barrel of monkeys — that’s the way the fans feel about the midget wrestlers whenever they make an appearance at Arena Gardens. PeeWee James, held in the firm clutches of Tiny Tim, appears a bit apprehensive as to what might happen when he gets within reach of Tim’s partner, Little Beaver, trying his best to look innocent of malintent. 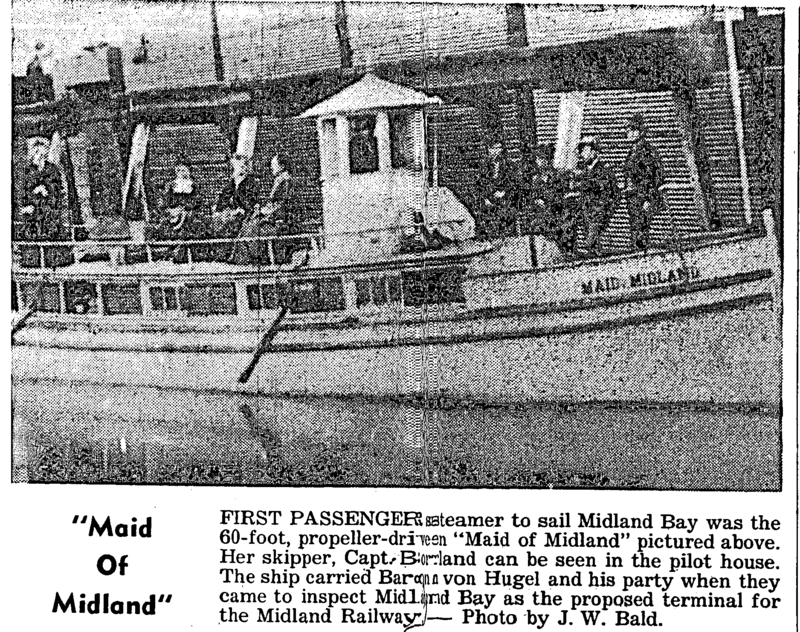 By W. R. Williams — The 60-foot propeller-driven wooden passenger steamer “Maid of Midland” was built for Capt. Borland at Coldwater about 1865. 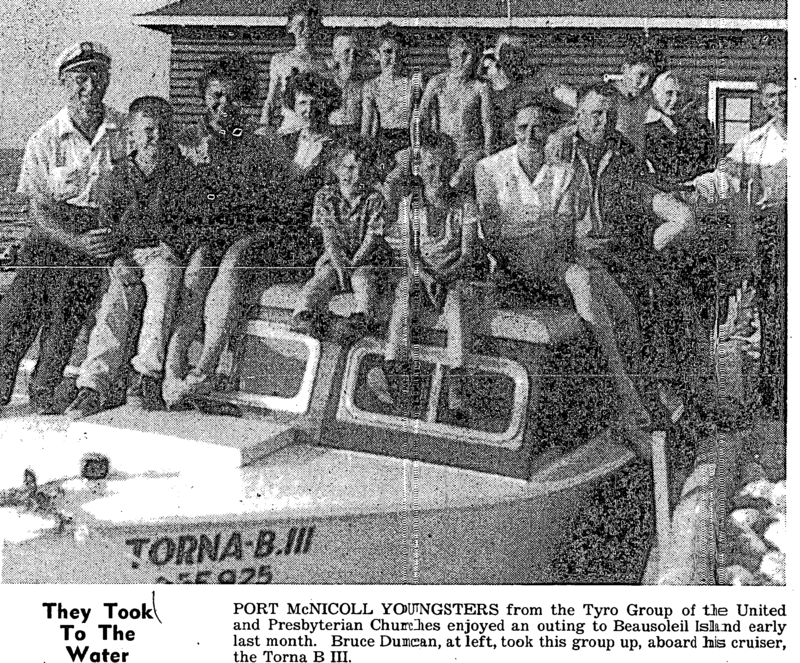 He used her to transport passengers from there to Waubaushene which at that time had docks which made the village a port of call for Georgian Bay vessels. Douglas Anderson of Coldwater was the engineer of the vessel. In November 1871 she was used to transport Baron von Hugel and his party to inspect Midland Bay as a proposed terminal for the Midland Railway. 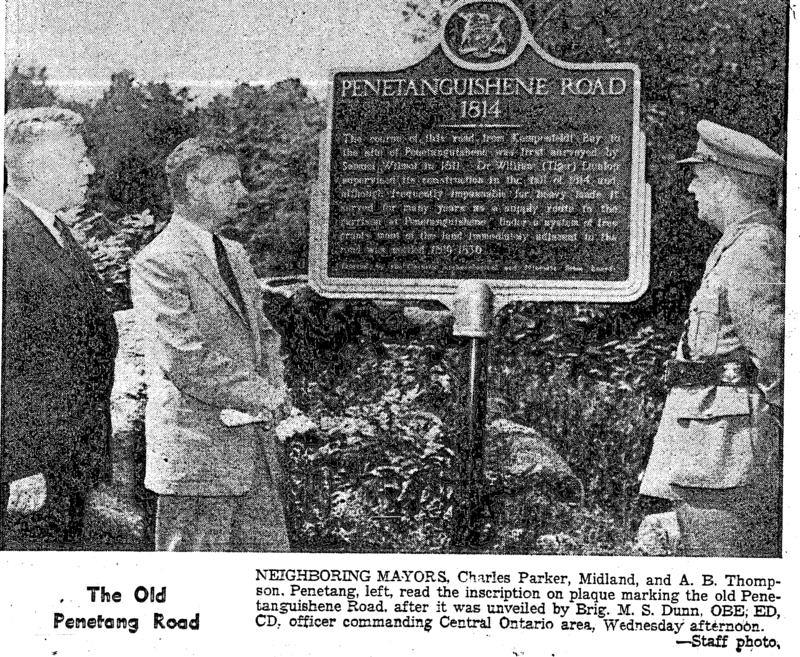 They had travelled over the railway from Port Hope to Beaverton, crossed Lake Simcoe on a steamer to Orillia and then travelled the portage road to Coldwater. Right up to July 1879, when the first passenger train reached Midland this little steamer carried the railway construction workers to such points as the occasion required. Sometimes she ran excursions from Midland. This 30-inch snake attracted attention when it was brought to Midland by Ernie Kirkup this week. 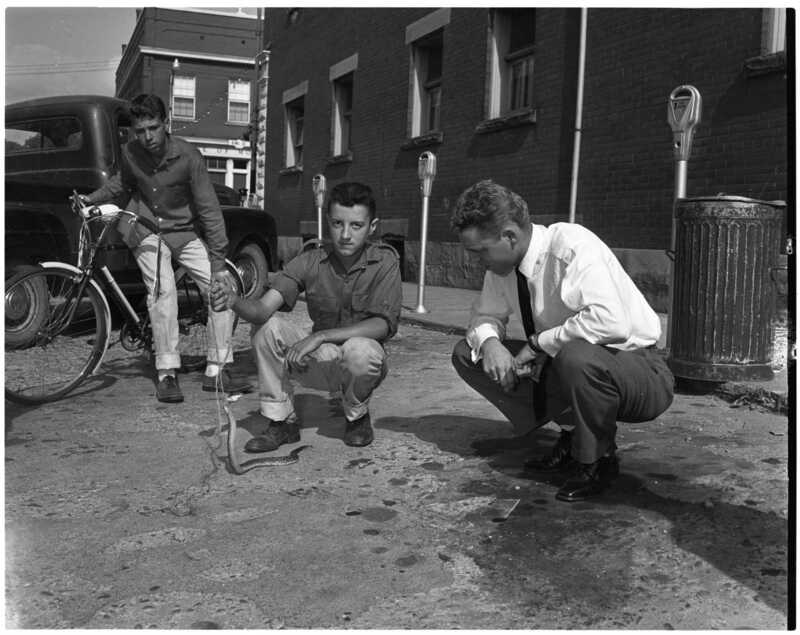 Ernie found the snake under a cherry tree on his farm near Ebenezer and believes it is an adder, onlookers are Allan Kirkup, 15, and Bob Bates of Midland. Ladders were the order of the day late Tuesday afternoon when Midland firemen were called to a roof fire at the home of Alderman Clint Smith, 270 Bay Street. 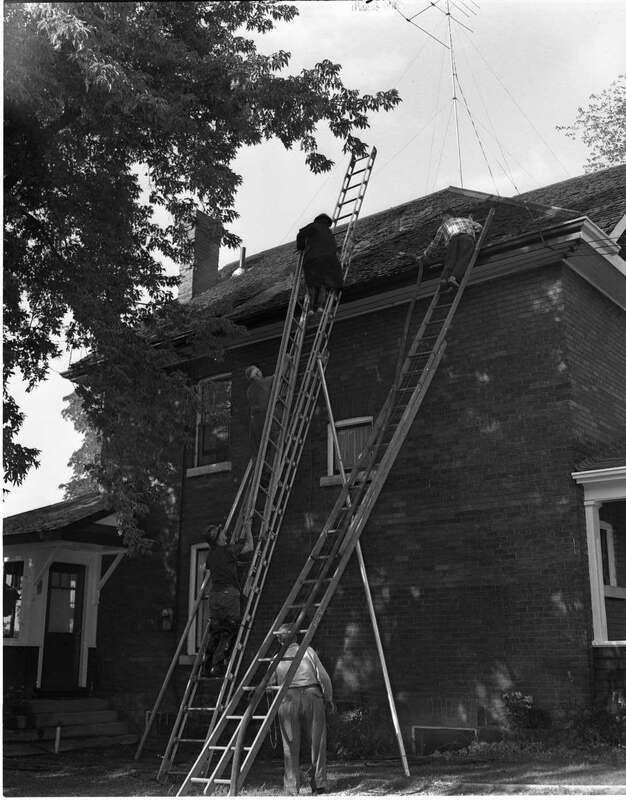 Although damage was not serious, it appeared much of the roofing material would have to be replaced. Midland hosts Simcoe County women’s golf championship at Midland Golf and Country Club. 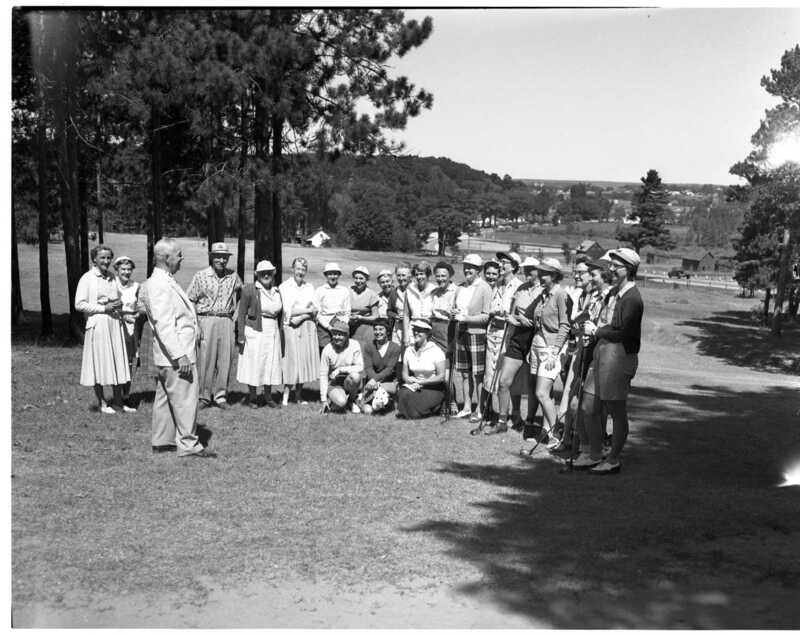 President of the club, George Ross, is seen welcoming some of the 48 golfers from Orillia, Collingwood and Barrie to the annual three-day event. Jack Westwood is the new clerk of the village of Victoria Harbour. He succeeds Walter Lumsden who retired recently. The headline, August 16, 1957, County Herald; Start New Replac Factory On Midland Waterfront. Construction started this week on the first unit of the Replac Corporation Canadian factory which is being constructed north of the Aberdeen Elevator on Midland’s easterly water-front. “Replac is engaged in the manufacture of fibreglass molded products,” says R. B. Moffatt, secretary manager of the Midland Chamber of Commerce. This is the fourth plastics company to locate in Midland within the past five years. Others are Midland Industries, United Shoe Plastics Limited, and Midland Reinforced Plastics Ltd. The headline, August 21, 1957, Free Press Herald; Teenage Reform School Escapee Caught After Weekend Crime Wave. Members of the OPP detachment at Victoria Harbour, as well as policemen in Orillia and other North Simcoe communities, heaved sighs of relief Monday morning with the arrest of a 14-year-old Toronto youth near Coldwater. An escapee from a reform school, the youth had kept police on almost 24-hour duty in the area following what Orillia sources claimed was “the worst outbreak of break-ins and thefts this town has ever experienced”. There was also a large number of thefts reported from parked cars and from the CNR station, in the Waubaushene area. 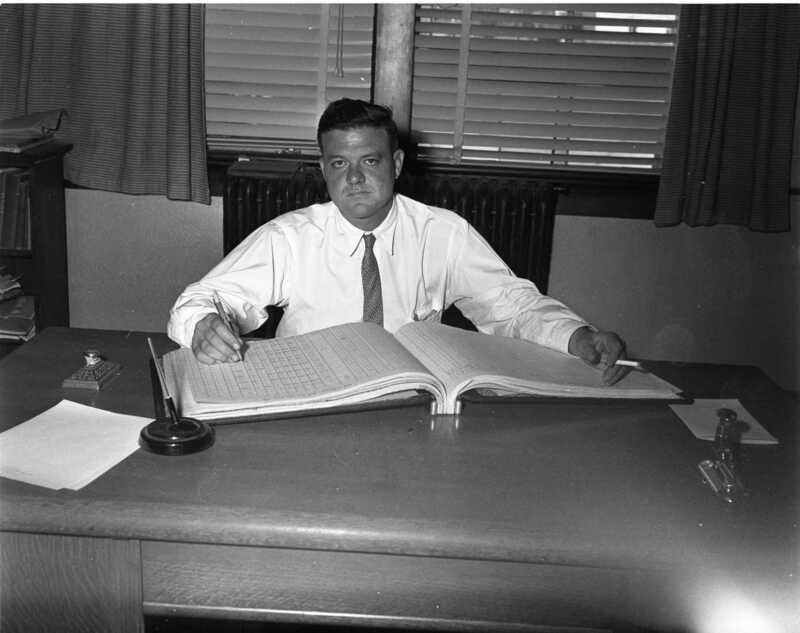 The headline August 23, 1957, County Herald; Smooth City Fraud Ring Bilks Midland Banks of Over $1,000.00; A smooth fraud ring operating in North Simcoe for the past two weeks bilked Midland banks of more than $1,000, Chief Robert Cameron said last night. Chief Cameron said he expected a break in the case, soon, as the thieves were doubtless back in Toronto and were known to Toronto police. They will “get the book thrown at them” when apprehended, he said. Generally, the frauds followed the same pattern. One of the ring would open an account in a bank with a cheque. Sometime later, he would draw out a large part of the original deposit, in cash. Most of the cheques were drawn on the non-existent Dorval Construction Company, or on fake Beamish Construction cheques. Chief Cameron said the men used a dozen aliases, and Elizabeth Street and Robert Street addresses. R. G. Gillies, manager of the Canadian Bank of Commerce in Midland for the past 16 years this week announced his retirement from active service with the bank. Mr. Gillies had a varied experience in the banking field prior to coming to Midland in 1941. Mr. Gillies plans to stay in Midland, where he is secretary treasurer of the Kiwanis Club and treasurer of the district advisory committee to the CNIB. 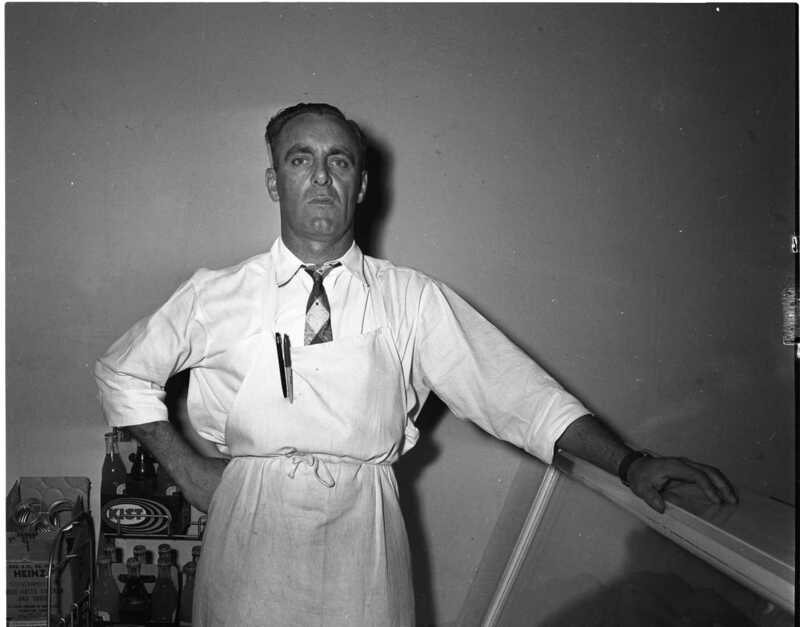 Value of building permits issued in Midland for the first six months of 1957 already exceeds the entire total for last year, according to the records of W. F. Turnbull, building inspector. The total value of permits to the end of June this year is $575,650, compared to $463,650 for the entire 12 months of last year. Total for the first six months of 1956 was $211,100. Large additions to the buildings of Midland Industries and the Ernst Leitz Company account for the great portion of this year’s figures, Mr. Turnbull said. Value of permits for private dwellings has declined considerably this year, he noted. Best year for building in Midland in the past decade was 1954 when the permit total reached $1,334,725. OBITUARIES – A resident of Penetang all his life, Robert Caughey died at Penetang General Hospital Aug. 2, following a stroke. Rev. G. R. Stanley conducted the funeral service Monday, August 5, from A. Barrie and Sons funeral home to St. James Church on-the-lines. Pallbearers were six nephews: John Curry, John Caughey, Leslie Selmon, Ernest Caughey, George Ward, and George Caughey. *** Dalton H. McConkey, step son of Mr. and Mrs. George Parr of Midland died of a heart attack in Kingston July 30. Only 43 years of age, he entered Queen’s University in 1947 after serving in the RCAF and in 1951 received his degree in Commerce and Finance. Since then he has been with the Dupont Company in Kingston. Active in numerous social activities around the Dupont plant, he was treasurer of the Plant Golf Club. Well-known in Midland, he was a graduate of Midland High School. In 1934 and after a year with R. C. Mulligan Drug Store went to Tamblyn’s in Toronto and then to a Kingston drug store. Mr. McConkey was predeceased by his father, Dalton G. McConkey in 1918 during the flu epidemic and by his sister, Mildred, in 1938. 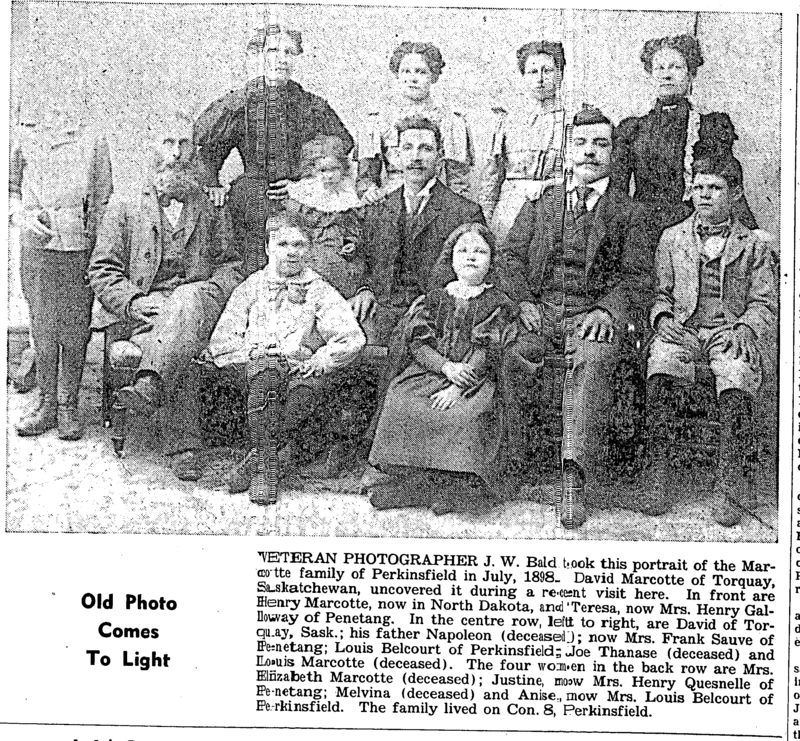 He is survived by his stepfather and mother, Mr. and Mrs. George Parr; Harold McConkey, a brother, of Toronto; Mrs. Fred Brodeur (Bessie)”, his sister, of Waubaushene; and Mrs. Bill Hanna (Peggy) of Toronto; and a nephew, Billie Brodeur, of Waubaushene. *** COLDWATER — Many relatives and friends attended the funeral service held from the funeral parlour in Orillia, Aug. 14 for Mrs. Vollick, who was for many years a resident of Coldwater. Burial service and interment took place at Coldwater. Mrs. Vollick, who was in her 74th year, was the former Olivia Raymond of Foxmead and was held in high esteem by all who knew her. Following her death at Orillia Aug, 12, where she had resided since her husband’s death, surviving relatives received many messages of condolence. During the years the family were in Coldwater the Vollicks resided on Gray Street. Mr. Vollick died about 12 years ago. 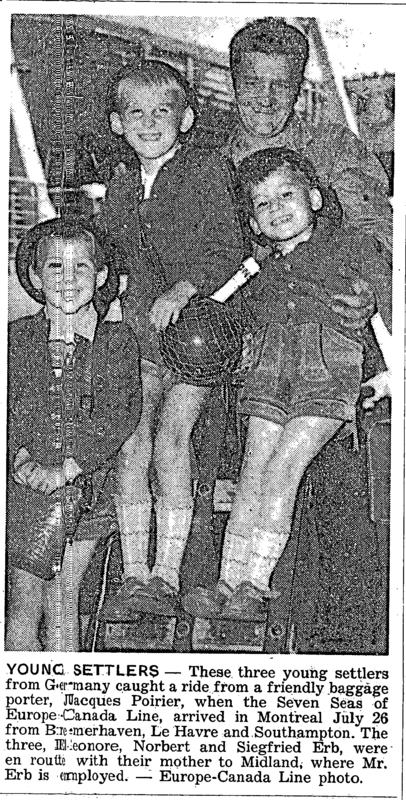 Most of the children were born and raised in Coldwater. A fondness of one’s home town often leads a fellow into some strange paths, in order to remain there. A good example of this is Fred Lemieux, who recently purchased Bowman’s meat market and groceteria on King Street. Born and raised here, Fred Lemieux is no stranger to Midlanders of several generations standing. But a lot of old timers rubbed their eyes and wondered perhaps if they weren’t seeing things when they first saw Fred in the grocer’s traditional white apron. Mr. Lemieux has had a number of jobs during his long career in Midland, but none of them remotely connected with the meat and grocery business. “But there are no openings in that trade in Midland right now, but my home has always been in Midland and I had no desire for a change. 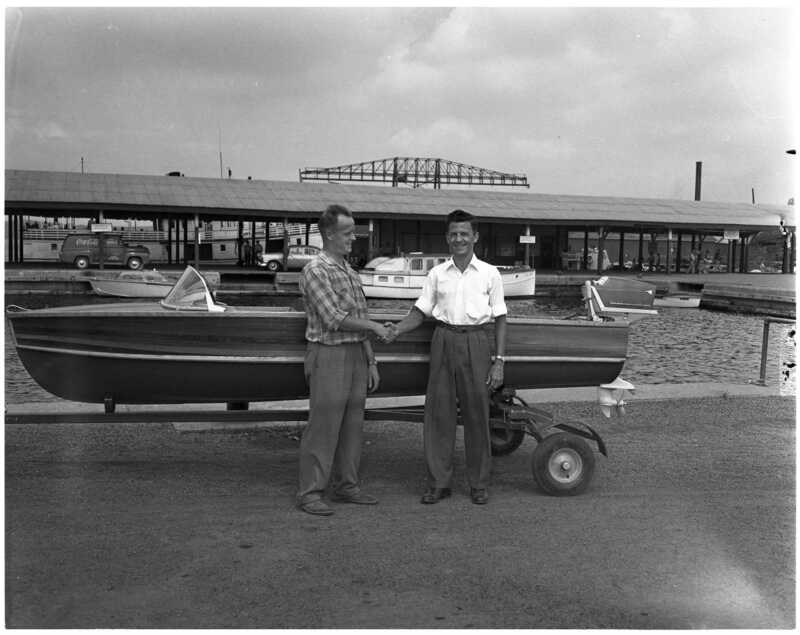 That’s why I decided to take a chance and purchase this business,” Son of the late Mr; and Mrs. Felix Lemieux, Fred spent eight seasons on the Great Lakes boats after he finished school. Then followed 19 years with Century Coal Co. He was assistant to superintendent Cecil Dunn when he left that firm last November, a position he had held for six years. From Century Coal, Fred went to the Dorr, Oliver, Long Co. in Orillia, manufacturers of mining machinery. But the long trip to Orillia and back each day wasn’t to his liking. Next step was to purchase the meat market and groceteria which had been operated by Bill Bowman for the past three years. As veteran Midlanders well know, there has been a Bowman in the meat and grocery business in Midland for close to a half century, and the name is still carried on in a shop on Yonge Street. And Fred’s aunt, Mrs. W. J. Bowman, still owns the building which houses his store. Free delivery will be one of the features of the service we hope to offer our customers,” Mr. Lemieux told this paper last week. 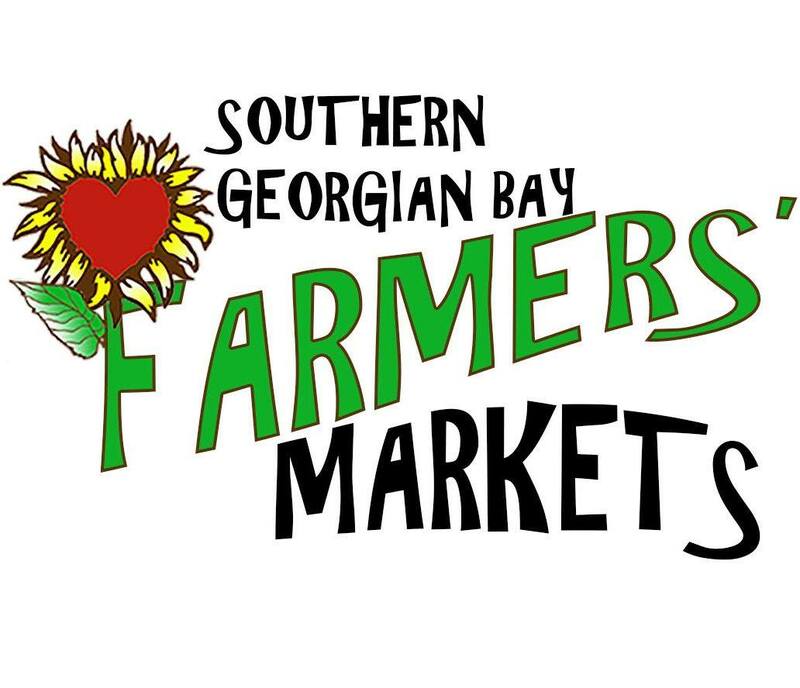 The store will continue to deal in fresh meats, vegetables, fruits and groceries of all kinds. Two veteran employees will remain with the new firm. They are Ed Carruthers, head butcher, and Daniel L. McKendry, who has spent a lifetime in such stores as Preston’s, Bowman’s and others. 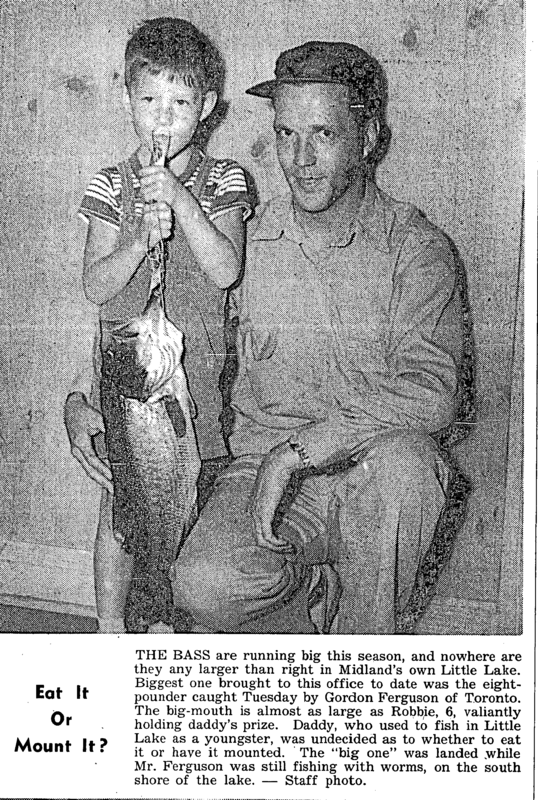 Also associated with Mr. Lemieux in his new venture are his son Rica and daughter Marion. TEN YEARS AGO THIS WEEK – Construction of the new bus terminal planned for the Penetang-Midland Coach Lines at Bay and Midland Avenue was to get underway by the end of August. 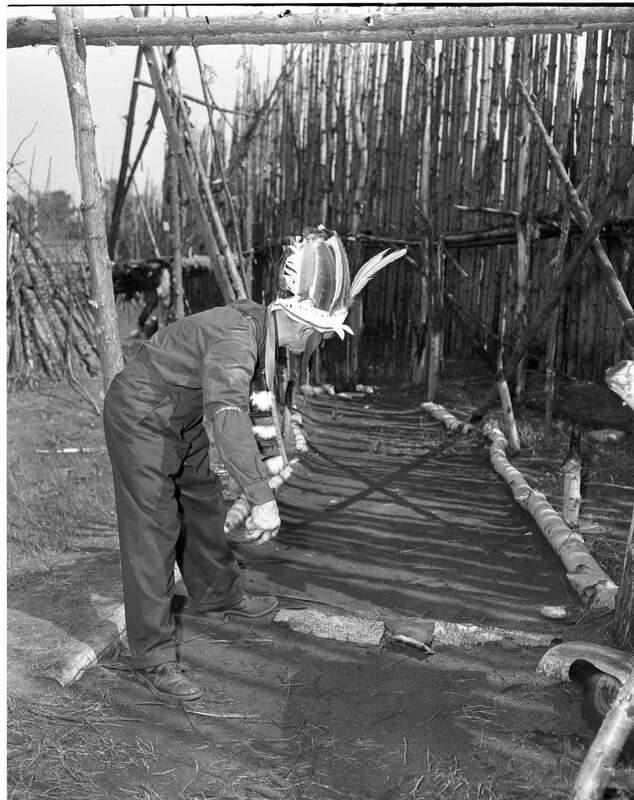 * * * Wilfrid W. Jury, a curator of the University of Western Ontario Museum of Indian Life made discoveries of a row of post moulds or palisades on the Irish Line of Medonte. * * * Penetang Lions won the first game of the Grey-Simcoe League playoffs against Barrie. * * * Records showed that 79 non-swimmers have passed the beginners tests at Midland playgrounds at Little Lake Park. The Red Cross program was divided into three levels; Junior, intermediate and senior of which a total of 150 tests were tried and passed. * * * Tenders were called for twenty more wartime houses in Penetang and a bulkhead wall at the harbour. * * * Carl S. Hallauer, president of Bausch and Lomb Optical Co. Ltd. of Canada announced his company would establish a branch plant in Midland. It was anticipated the unit, including office personnel, will employ 60 persons. * * * D. W. Haig, Mrs. Frank Hartman; Mrs. A. J. Preston, Mrs. C. H. White and Mrs. F. H. Bell represented the Midland Golf Club at the three-day Simcoe County Ladies’ championship held at Orillia Golf Club. BIRTH – Mr. and Mrs. Gordon Walker wish to announce the birth of their son Glenn Edwin, on Aug. 19. 1957, in St. Andrews Hospital Midland. Following the signing of an agreement Monday night, Bay Mills Limited employees ended a two-week strike at the Midland plant by returning to work yesterday morning. The textile factory is now back into full production. Signing the agreement were general manager Steven Cerny; president Harold Keefer of Local 1033, Textile Workers Union of America; Frank Koenig the local’s financial secretary and TWUA area representative Ray A. Ruggles. The walkout of nearly 50 employees lasted for nine and a half working days. The agreement stated that both parties recognize that nothing contained in the union contract prohibits the company from conducting its operations on the basis of three shifts per day. With a spectacular splash and the cheers of hundreds of well-wishers, Imperial Oil’s newest tanker, the 375-foot Imperial Quebec, was launched here today. Mrs. W. O. Twaits, wife of Imperial Oil’s executive vice-president crashed the bottle of champagne across the Quebec’s bow and christened her as workers chopped away ropes to let the hull slide sideways into the Canadian Shipbuilding and Engineering Company’s launching basin. You are Welcome, Linsdey! That’s the great thing about local history…it’s Our Story!